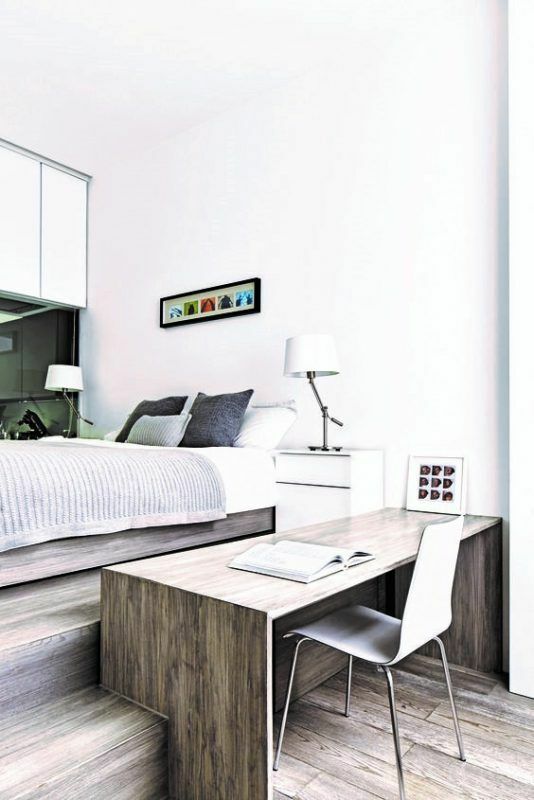 Minimalist is always related to a really tidy almost empty room. 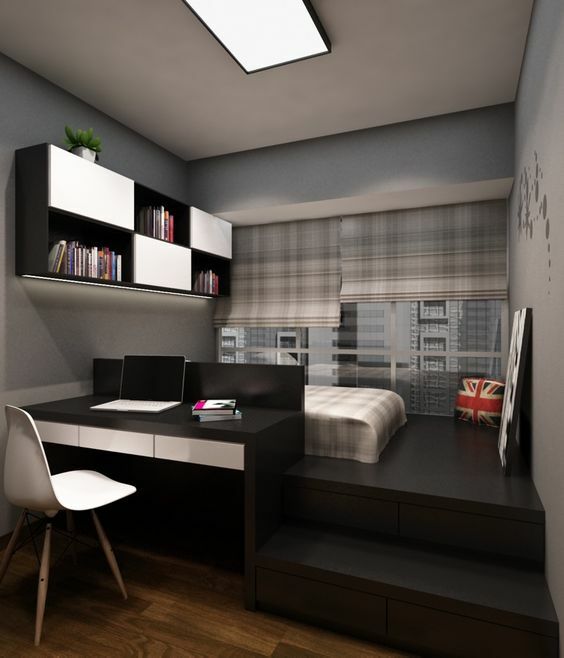 However, of course no matter how empty your room is, you would not want to forget the beauty and the function you can gain from your own room, like a study area. This will be a luxury that a student or a person who works from home will really appreciate. Well, let’s see how all those things can mix in a bedroom. In this picture below, you can see how minimalist the room is. Everything is in wooden material from the floor, the shelves, the table it seems like it’s all continued. 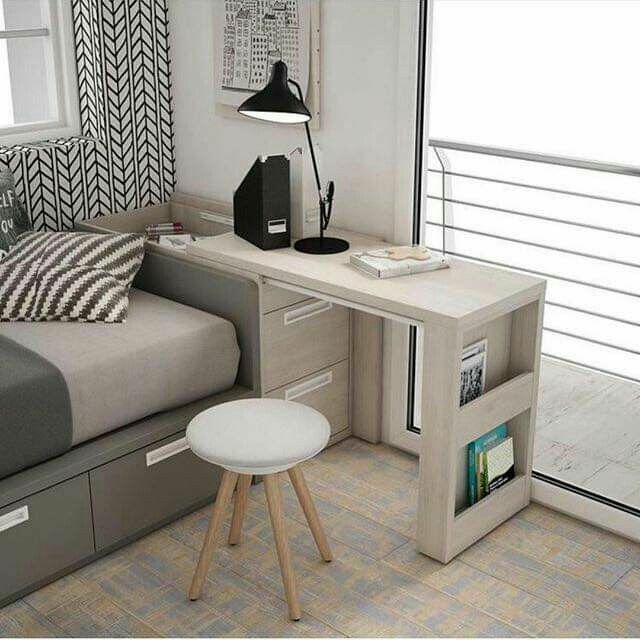 The bed itself is on different level floor from the study that it actually on the same level with the table. The interesting part from this room is also the cushion on the head of the bed that it makes a comfortable accent wall. 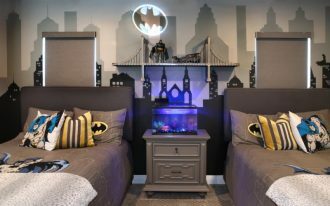 This one also has similar set with the previous one with bed on different level from the study. 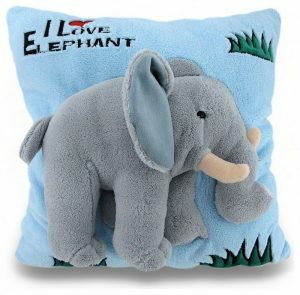 However, this one is clearly has bedding for the bed. Also, with different color, this one offers different kind of ambiance. The washed out grey wooden combined with white wall makes it even minimalist. This one is really beautiful with its blue wall that gives more spectrum to the room, not only the color of wooden floor. Another interesting thing is where this bedroom is positioned near the window. 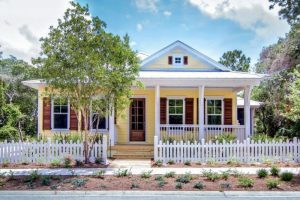 Window that large will make everything different both day or night. 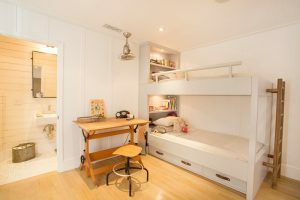 And the best thing is that there are storage room under the platform, a perfect thing for a small minimalist room. 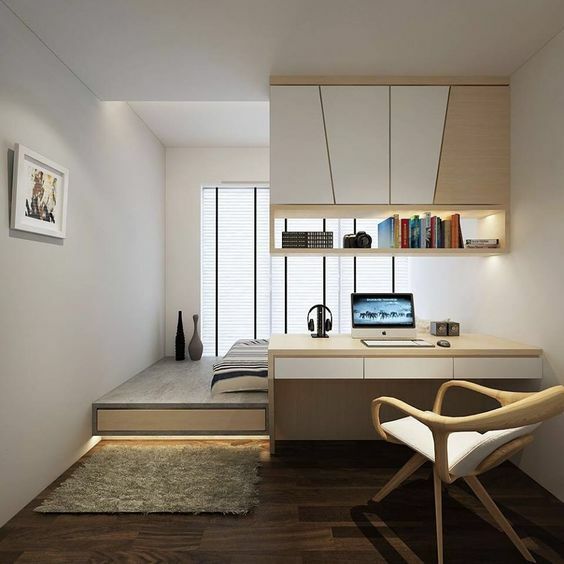 This one is another interesting minimalist bedroom with bed put in platform not as high as the previous ones. The large window helps the room get enough light from outside. It also makes the room felt bigger. 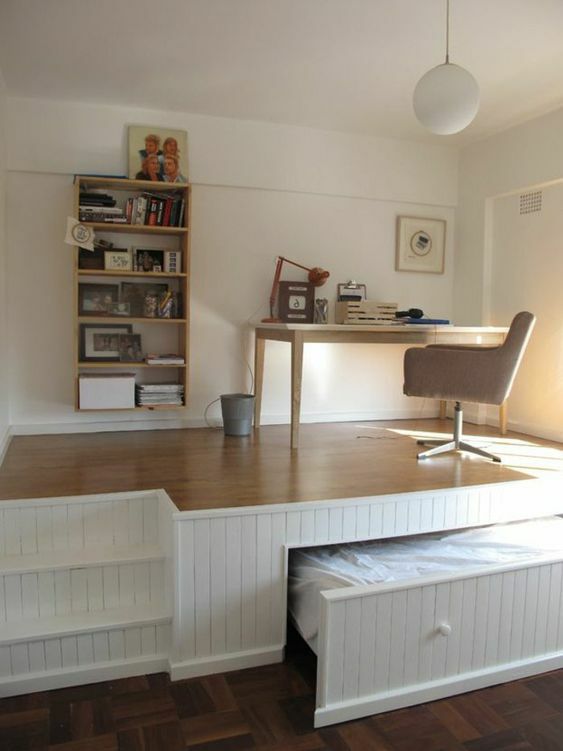 The other interesting thing is the storage under the platform of the bed and another storage above the table. 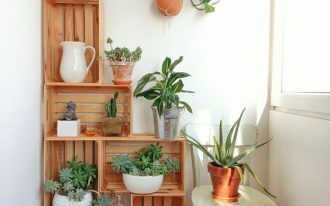 Many storage places enable the room to looks always tidy. While the previous one offer light color, this one is more on dark color. And look how beautiful it can be. 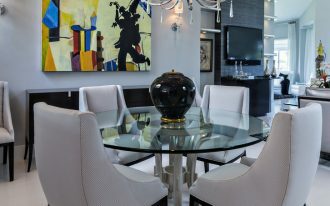 The depth that the dark color created really helps the room to look dynamic. With a little touches of white color here and there, the room looks nothing like a dark thing. 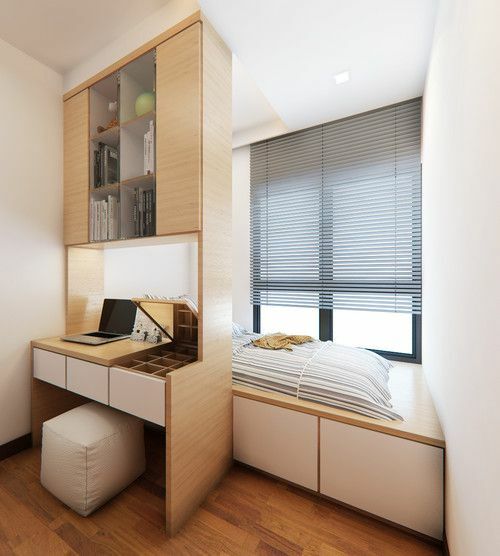 Also, the hidden storage under the platform is perfect for a small minimalist room. 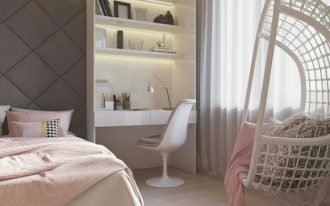 This bedroom is really pretty with its smooth wooden platform near the window with lighting fixture under the hidden storage. 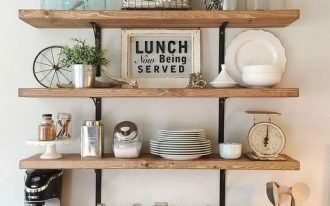 Another beautiful part of the room is the table and shelves above it in which design has the sleek and smooth lines as well as calming color. The chair here is also really interesting as it lets you rest perfectly too. Similar with the previous ones, this one also has the table on the platform with storage under the platform and stairs. The study is on the side of the platform with shelves and storage above the table. The interesting part is the accent of fence between the bed area and the study. Completely different from the previous ones, this one here has the bed under the platform and the study area is on the platform. 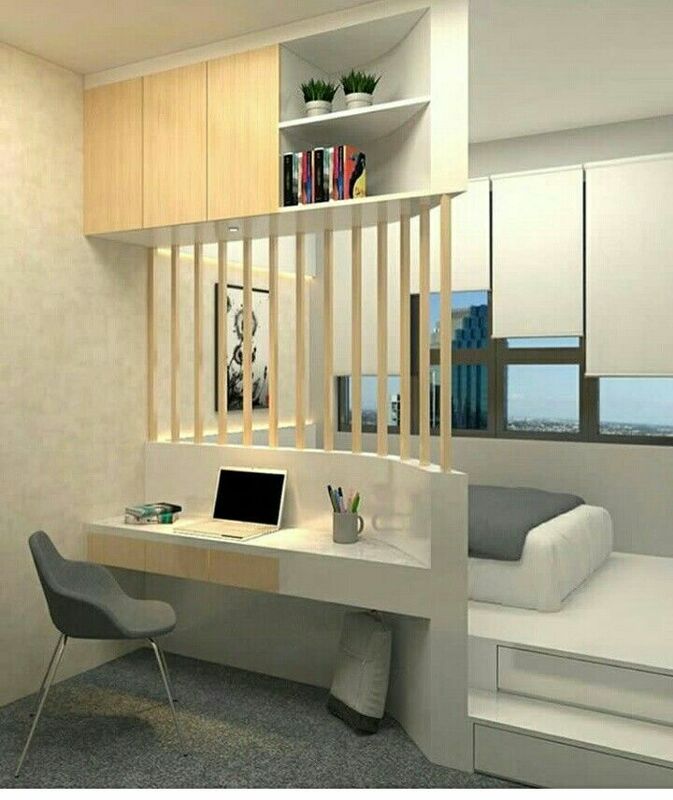 This interesting switch is for you who likes to always keep the bed inside and transform the bedroom as a sole study room. This one here is similar with the previous one but with smaller space and the sliding bed under the platform. This one here is quite permanently as you can see the shelves near the head of the bed. This one too is not as minimalist as the previous one as one of the wall has been an accent wall and make everything merrier. 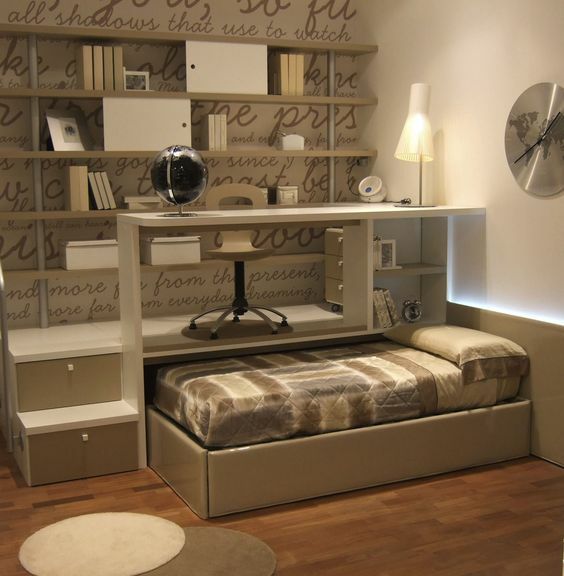 The picture below is also an interesting bedroom with its sliding cabinet/table. The top of the cabinet can be slid to make a tough table. And not only that, the table itself has shelves on the side. 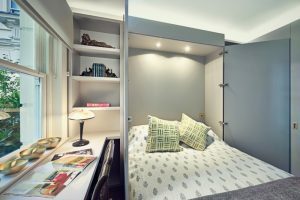 And to meet the minimalist theme, the bed is a single bed that face the side of it as you can see the storage under the bed and from where the pillow face the room.